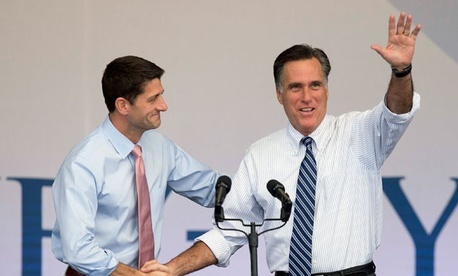 Former GOP nominee Mitt Romney and his running mate Wisconsin Rep. Paul Ryan had their first post-election sit down at the JW Marriott in Washington, D.C. Thursday, while Romney was in town for lunch with President Obama. "I remain grateful to Governor Romney for the honor of joining his ticket this fall, and I cherish our friendship," Ryan said in a statement released after the meeting. "I'm proud of the principles and ideas we advanced during the campaign and the commitment we share to expanding opportunity and promoting economic security for American families." An aide to Ryan called the meeting a "constructive and positive conversation," and said the two men shared updates about their families, reflections from the campaign, and their "forward-looking conversation focused on resolving the critical fiscal and economic challenges ahead."